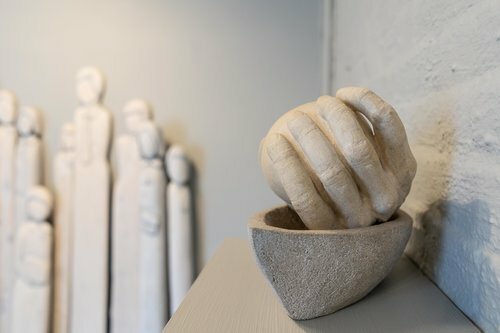 Alone Together, Together Alone was an exhibition of works by Nora Valdez in Urbano’s front gallery. 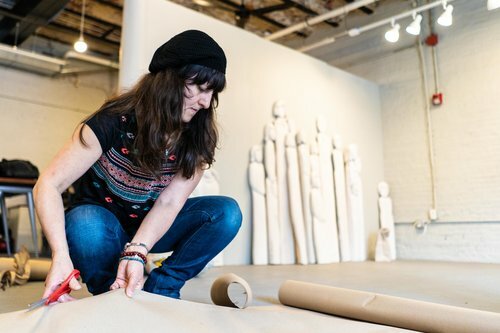 She presented a series of figurative sculptures and drawings honoring the heart, emotions, the home, immigration, and confronting difficult situations in the search for happiness. These themes originate in her personal and cultural identity. Nora Valdez’s body of work evokes the conditions of travel, transition, and displacement. The image of the bag recurs as a metaphor for both container and contents: a suitcase stuffed with personal effects, as well as a body enveloping a mind (and heart) filled with memory, loss, desire, anxiety, and above all dreams and hope. Valdez is a world traveler: born in Argentina, living in Italy, Spain, and the US, and exhibiting across South America, Europe, Asia, the United States, and Canada. In 1986 she moved to Boston, the city she now calls home. 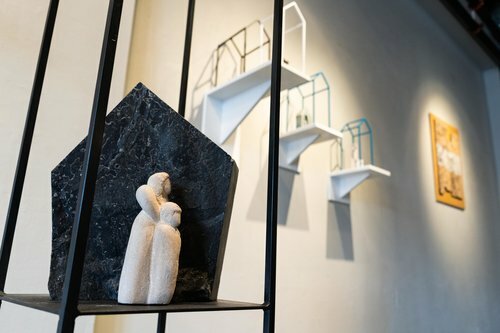 Valdez was the last artist-in-residence at Urbano for the 2018 exhibition season about Resiliency and Sustainability.